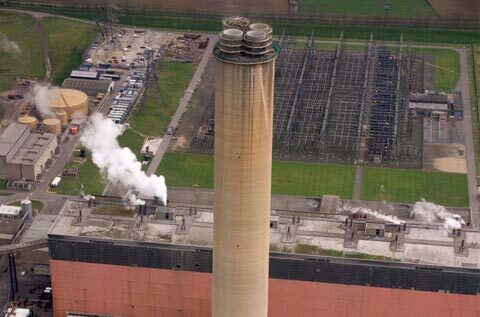 British coal-fired power station uses PennguardTM linings to prepare its existing multi-flue chimney for wet stack operation. EDF Energy Cottam Power Station is a 4 x 500 MW coal-firing power station near Lincoln, England. 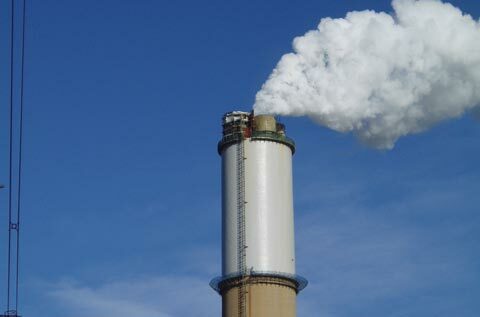 In 2003, with tightening SO2 emissions regulations threatening to restrict its operational capacity, EDF Energy Cottam decided to install flue gas desulfurization (FGD) plants in all four units. 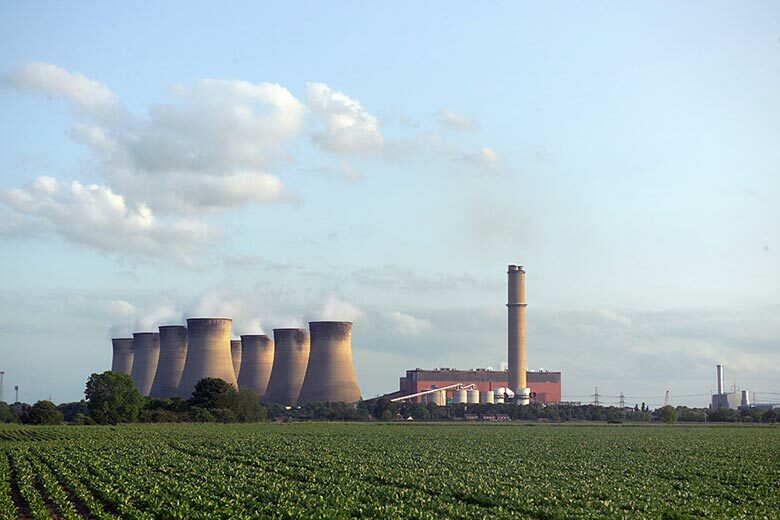 Since 2000, EDF Energy’s other large coal-fired station – the 2,000 MW West Burton Power Station, situated only 5km away from Cottam – had been operating four wet limestone FGD plants. This same wet limestone FGD technology (which produces gypsum as the end product) was selected for Cottam. EDF Energy Cottam used a specific approach to minimize both the investment cost and the future operating costs of the FGD plants. 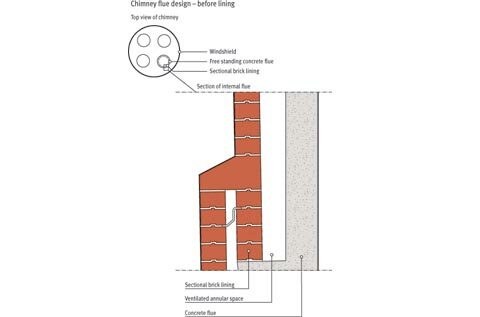 To begin with, Cottam’s existing 200m high, four-flue chimney was carefully inspected. Its concrete shell and four concrete flues, and their sectional brick linings were found to be in good condition. 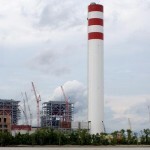 It was concluded, that the chimney could continue to be used after the FGD retrofit, provided that the flues could be prepared for FGD operating conditions. Furthermore, it was agreed Cottam Power Station could run the FGD plants without flue gas reheat, allowing the FGD units to be placed closely around the chimney, with a relatively simple ductwork design. One of the main challenges of this approach was to minimize any risk of droplet carryover resulting from operation with water saturated flue gas. EDF Energy Cottam selected Alden Research Laboratory from Holden, Massachusetts, to assist in the design of the FGD outlet ductwork and chimney flue linings. 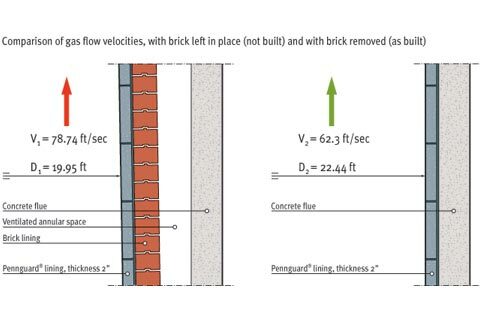 Based on Alden’s recommendations, EDF Energy Cottam decided to remove the brick linings from the four concrete chimney flues and to protect the inner concrete surface of each flue directly, using the PennguardTM Block Lining System. The chimney is 200 m high with four flues. 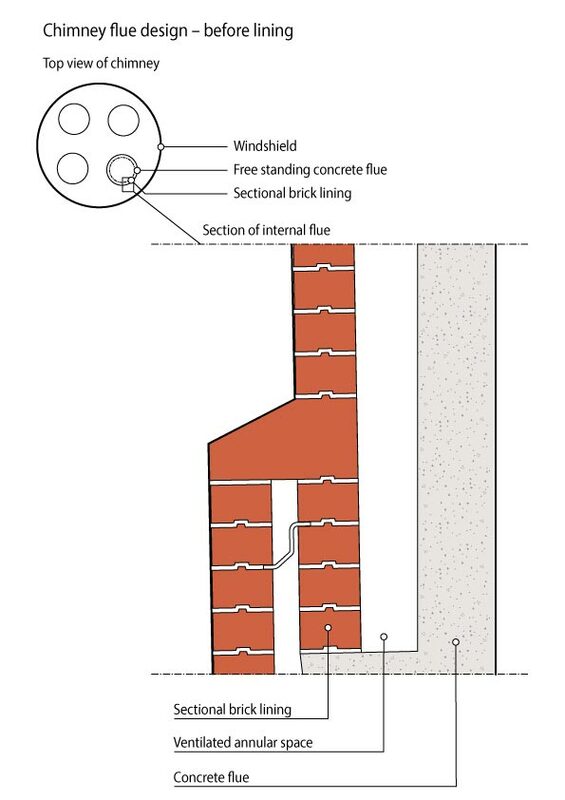 The four internal flues are made of concrete, protected internally by a sectional brick lining. 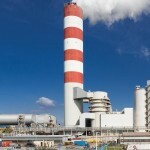 The four FGD plants will be built without reheat. To prepare the flues for wet stack service, the brick is removed and a PennguardTM lining is installed on the concrete surface. 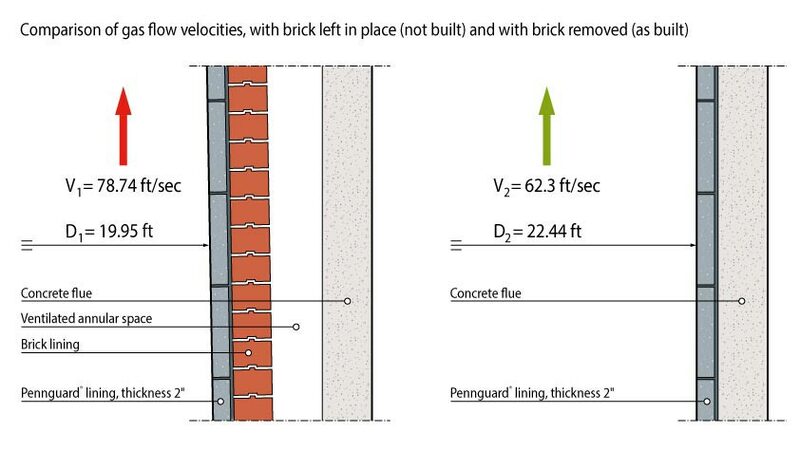 Removing the brick increases the net diameter of the flues, so that the gas flow velocity will stay within the allowable range for wet stack operation. 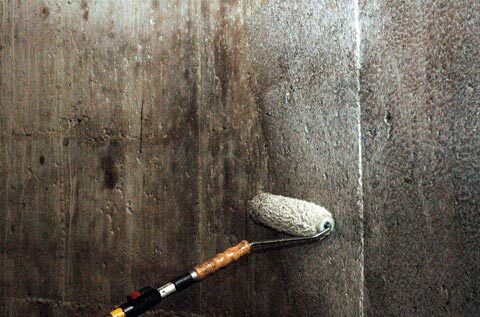 The concrete surface is prepared by grit blasting, partial resurfacing and the application of a PenntrowelTM EpoxyPrimer. 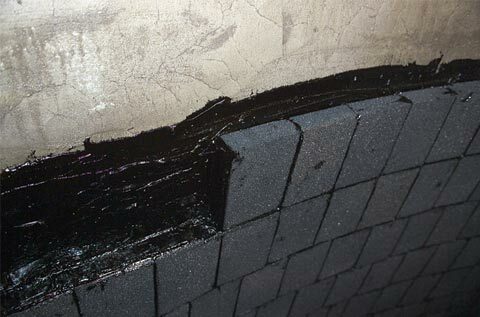 The PennguardTM lining is installed to the concrete surface by trained bricklayers. Hadek inspectors supervise the lining installation works. Hadek supplies special, automated mixing machines, which help to mix the PennguardTM Adhesive Membrane with consistent quality and a high productivity. The installation of the PennguardTM lining system in one flue takes 30 days, not including the floor area. A wet stack’s main undesirable side effect could be the acidic droplet deposits on the power station and the surrounding area. 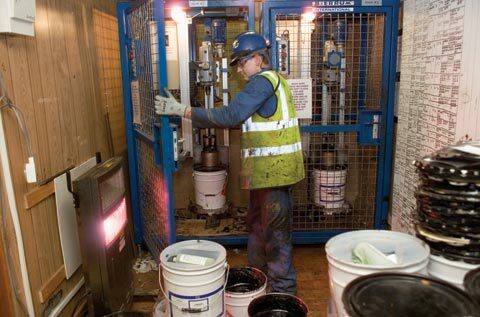 In order to prevent this phenomenon, EDF Energy Cottam commissioned Alden Research Laboratory to design an integrated approach to liquid droplet collection, starting from the mist eliminators of the FGD absorbers, all the way to the tops of the four chimney flues. Alden started off by building a 1/16 scale plexiglass model of the ductwork to predict the exact behavior of condensate droplets in the gas stream, as they make their way to the chimney. Based on test observations, using this model, Alden’s experts could determine the optimal approach for collecting and draining the condensate from the duct system, before it could reach the chimney. Additional liquid collectors were placed in the entry zone of each chimney flue. 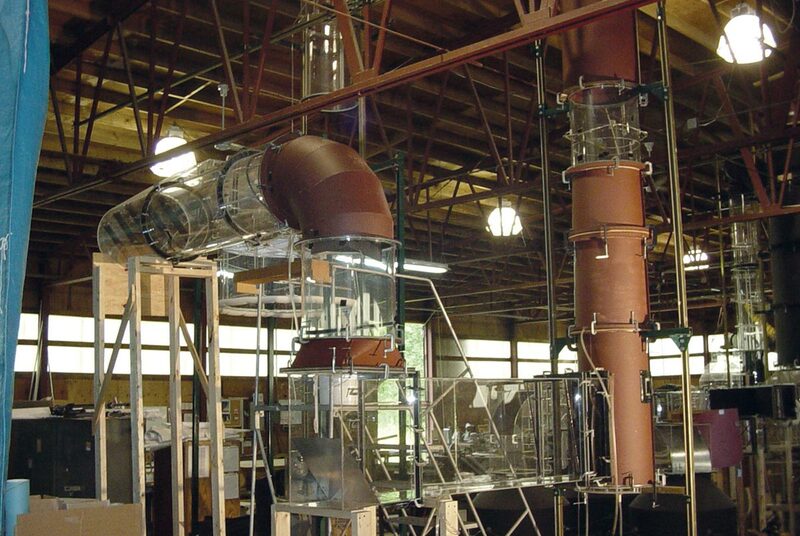 The approach chosen for the modification of the chimney flues was also directly aimed at minimizing droplet carryover. By utilizing an insulating PennguardTM lining the condensate formation during start-up will be minimized. The textured surface of a PennguardTM lining has good “wetting” capabilities, ensuring that the liquid film cannot flow together in thick streams. 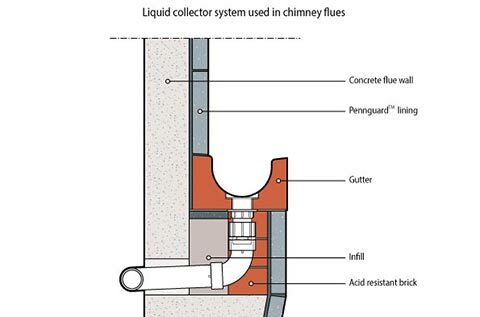 To further improve the safety of the design, Alden recommended to use all of the existing supports for the old brick lining as locations for liquid collection gutters, where condensate is caught and led to drainpipes on the outside of the flue. With 20 such gutters over the height of each 200m flue, the risk of a thick condensate film forming anywhere in the flue is virtually eliminated. 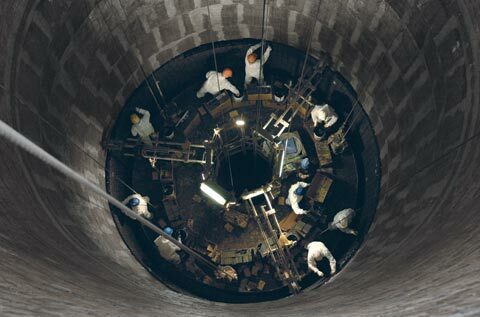 When the first flue had been commissioned as a wet stack, power station engineers went to the top of the chimney to personally check for droplets. Their observations confirmed, that the design was working well and the flue gas felt effectively “dry”.